Splash Orange Amère begins with a strange mix of oily bitter orange and bergamot mixing with tangy-spicy (peppered) tarragon, a green and "edgy" scent. There's a food-y vibe to Splash Orange Amère, not the usual vanilla-sugar-caramel-toasted nut syrup, but a crisp, healthy-summer-salad smell. The base of Splash Orange Amère reminds me of the scent of dried potpourri with lots of pale, stiff orange rinds — and a faded, "nostalgic" aroma. Splash Orange Amère has a scent progression from green spring to moody winter. One could expect Commune de Paris 1871 to smell of gunpowder, burning wood, stone and mortar dust, sweat. Not so! It smells more like what Sand and Flaubert might have smelled (and smelled like), writing to each other from their comfortable country homes, Nohant and Croisset. 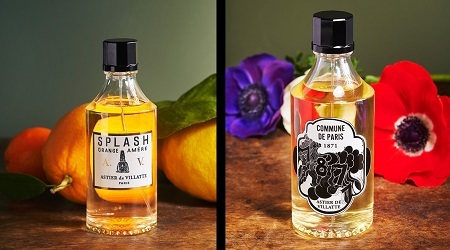 Commune de Paris 1871 is sweet and "composed," a lovely scented mix of country-walk (lemon and bergamot leading to lavender-coumarin-moss) and cozy parlor — a smooth benzoin-patchouli accord combining with scents I'll describe as "candy dish" and powder puff. Commune de Paris 1871 charms me. As I wore Commune de Paris 1871 over several days, it reminded me of two perfumes: Guerlain Jicky (without the musk) and Chanel Pour Monsieur Eau de Toilette (both old favorites of mine). Proviso: in order to really experience Astier de Villatte perfumes, you cannot be a 'dabbler' (a drop on each wrist); that type of application will result in ten minutes of scent. The Astier de Villatte 150 ml bottles are made for generous application. When lavishly sprayed on skin, the complexity of the colognes is apparent and the enjoyment they provide lasts for hours. How did Flaubert (way to the right of Sand politically) respond to her letter? 1. See reviews of Naples and Delhi. 2. Perfumer Christophe Raynaud: listed notes of bitter orange, bergamot, grapefruit, black pepper, cumin, tarragon, blond wood, oak moss. 3. Perfumer Françoise Caron: listed notes of lemon, rosemary, bergamot, pink pepper, lavender, labdanum, benzoin, patchouli, vetiver, cedar, Benzaldehyde (created in 1866) and Coumarin (created in 1870). 4. Flaubert-Sand: The Correspondence, translated by Francis Steegmuller and Barbara Bray, Knopf, 1993; letter number 278. 5. Ibid. ; letter number 284, Sept. 8, 1871. Thank you Kevin for introducing me to this line. I will be adding Commune de Paris to my ever growing “must smell” list. Sounds interesting. I love Flaubert’s age-old response to Sand. So very true. Laura…and try Eau Chic, too…it’s great. I need to share your review and quoted letters with my husband….he’s always lamenting how irrational people are. Why won’t they just do the right thing? Also – you have my attention with the Jicky comparison. These sounds really nice. Sariah, they are nice; one of the rare lines when I like all the scents. Great historical quotes, Kevin. But there is something about them that gives me the heebie-jeebies! They sound great. I have the AdV Eau de Cologne and like that a lot. It is made for a refreshing dousing. Mrs Dalloway, that’s a great cologne. A. de V. is also available at Osswald in NY (http://osswaldnyc.com). When I was in the store a little over a year ago, they had both the fragrances and the candles. A recent check of the their website shows they only have a couple of the former but many of the latter. Not sure if the website reflects what they actually have on the shelves. Bravo, thank you for that. As I recall, I, too, whooped when I learned I could get AdV samples from AdV. I’m seriously considering a 50 ml of Commune de Paris. That weird Elixir du Docteur Flair is interesting, too. Noz: YES! Did you try Grand Chalet yet? Yes, I like that, too. AdV is a great line! I clearly need to try these. Thanks for pointing them out!